on a journey to thrill and enthrall your heart and soul. Are you catching children being good? Are you a positive and proactive parent or educator? The procedures presented in this book are those derived from the author’s educational practices within a positive, proactive and preventive behavior management approach that she has been implementing for more than fifteen years. These procedures present themselves as effective habits for the personal transformation of adults, as well as for use with children at home, and with students at school for the management of their behavior. The author presents the COMPLETE Model that she has created as a transformational approach for parents and educators. Every chapter will introduce and explain a step from the model, as well as provide examples, procedures, strategies and tools to guide step-by-step implementation. If we want to see changes in our children and students, we need to begin changing ourselves. 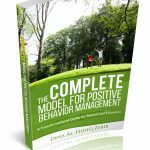 This concise and practical educational guide will aid you to model and represent the changes that you would like to observe in your children and students, while creating positive and proactive environments necessary for their academic and behavioral success. During her childhood and young adulthood, intelligent and curious Sara is encouraged to explore who she is, and to pursue education and a career that will make the best use of her many gifts. The gift of true love comes to her unexpectedly, when she meets Hani, a young man who is her soul mate. Together they commit to a life together full of devotion…but Sara’s destiny takes an unexpected turn, throwing her into a cycle that she could never have imagined. With the assistance of a kind therapist, she begins to reflect back on the decisions that brought her where she is today…the crossroads that led to her destination. Will she be able to retrace her steps and salvage what she already had? Crossroads is an introspective, thought-provoking book that will resonate with every woman who has struggled to find her path in life.